The First Congregational Church in Berlin, Vermont. In the first of those (asked, I hasten to add, when I still had some of my baby teeth), I was seeking moral guidance about my behavior. Based on my chances of getting into heaven, I won’t be dishing out advice on moral normalcy in Dear Mona. In the second example, I was seeking statistical guidance about how I performed relative to others in my class. Based on the fact that I will rarely know how your classmates, siblings or teammates are doing, I also won’t be looking at the normal distribution of a small group in a Dear Mona column either. In the third and last example, I was seeking information about prevalence — I just wanted to know how many other people were like me. And that’s where I hope I can offer readers some useful information. But if there’s a risk that the word “normal” might be misinterpreted to be about anything other than prevalence, I’ll steer clear. It’s what Sister Rosemary would want. OK, now back to the column. Dear Mona, I go to church almost every Sunday (I am also a Protestant). How many other Americans do the same? Despite the constant prognoses that the United States is becoming less religious, plenty of people say they attend religious services. Gallup has been asking the question for more than 70 years, and attendance is virtually the same now as it was in 1939: Four in 10 Americans say they’ve been to a church, synagogue or mosque in the past seven days. Except for a jump in the 1950s, that figure hasn’t changed much in the intervening years either. Sounds like there are plenty of people like you. But not so fast. Being young, you are a little surprising, John. Just 18 percent of the respondents in your age group (18 to 29) say they go to a religious service weekly. 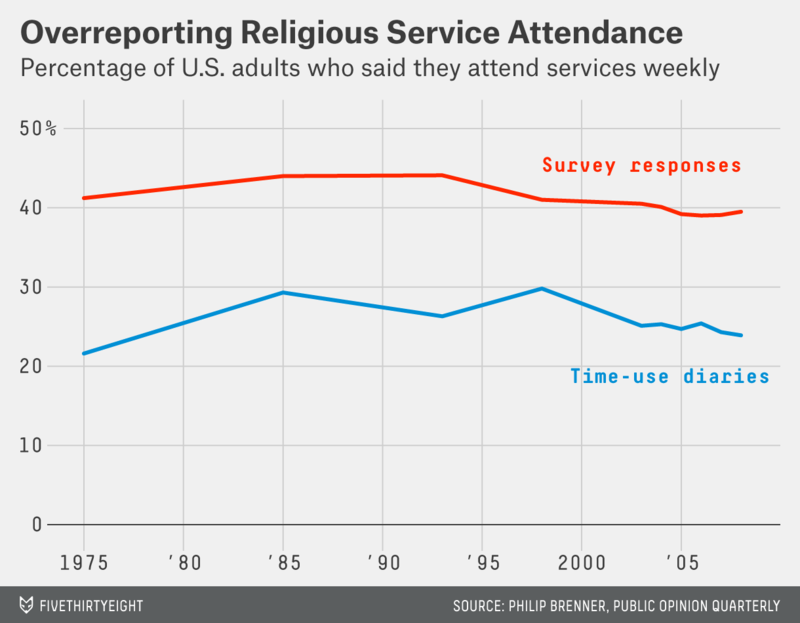 I could leave it there and say that — age aside — there’s nothing surprising about your weekly attendance, but that survey data doesn’t necessarily disprove that Americans are becoming less religious. For one thing, this is self-reported data, and even religious people can exaggerate. A report titled “I Know What You Did Last Sunday,” published in May by the Public Religion Research Institute, found that when speaking to an interviewer over the phone, Americans are more likely to say they go to religious services at least weekly than when they fill out a survey online (36 percent compared to 31 percent). When Philip Brenner at the University of Michigan’s Survey Research Center looked at time-use diaries, the gap between the facts and the faithful’s claims was even wider. What’s more, when the researchers took an international perspective, they found that Americans overreported more than other nationalities. But you wouldn’t lie to me, would you, John? So that makes you slightly less commonplace than those Gallup survey respondents would have you believe. It appears there might be a bit of social desirability bias going on; that’s when people fear being judged, so they provide inaccurate answers to questions, such as “Would you waterboard a terrorist?” or “Do you give to charity?” But fibbing about church attendance isn’t the only reason why religious practice in the United States appears to be waning. Beliefs are changing, too. That’s most evident in the rise of the so-called nones; that is, the religiously unaffiliated. 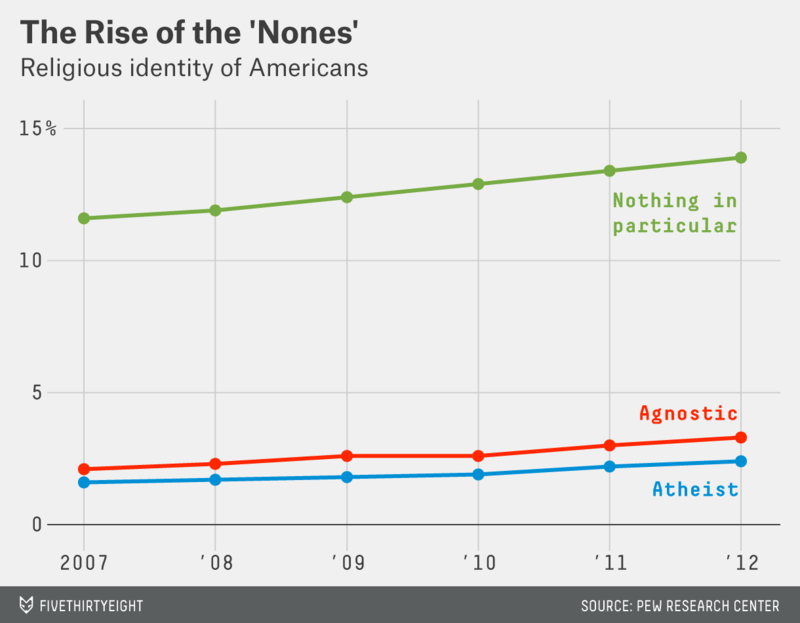 They, more than atheists or agnostics, are reshaping the religious contours of America, and they’re doing it rapidly. Between 2007 and 2012, they rose from being 15 percent to 20 percent of all U.S. adults, according to the Pew Research Center. While nones might be on the rise, Protestantism, your denomination, is experiencing a long-term decline, according to Pew. In 1972, 62 percent of Americans were Protestant, compared to just 48 percent in 2012. That’s a sharp contrast to Catholics, who have fallen just one percentage point over the same period, down to 25 percent of Americans. Some basic demographics would suggest that he’s right. Although fewer young people say they are going to church, the nones are a young bunch: 32 percent of 18-to-29-year-olds say they’re unaffiliated to any religion compared to just 9 percent of those 65 and older. Still, John, attending a religious service on a weekly basis is common. You’re just slightly more unusual for doing so at your age.